Today I challenge you to challenge your employees to challenge each other! Hosting challenges is a great way to give your program momentum, create healthy competition and social support, or be used to lead up to and celebrate a special event. There are many kinds of challenges you can run to motivate your workforce, so don’t feel confined to this one and get creative if you can. BUT, because I’m obsessed with my FitBit right now, I’m going to focus on helping you start a step challenge. You will need to decide how to track participants and their steps, communicate with staff, create a leaderboard, communicate some more, and finally, reward the winners! I know not everyone has a wearable step counter. Have no fear! There are still options. Most smart phones have accelerometers and track steps too with the use of some free apps. Iphones already have Apple Health doing this and Samsung has S Health. FitBit also allows participation without a wearable if you install the app. There is also the option to use inexpensive pedometers. You could track minutes per week walked if you would like to scratch the steps altogether. (Though this means that only intentional walking sessions would count as opposed to all day activity.) Whatever you chose, you’re going to need some sort of reporting system in place to track everyone’s efforts. You can use a third party vendor like Wellable or MoveSpring where employees can log in and manage their own profile through an online portal. This seems to be the easiest and compiles your leaderboard data and participation rates for you. Otherwise you will be relying on self-reporting by the employees and more effort from them on a daily or weekly basis. This can be a deterrent to participation and rack up some payroll costs. Once you’ve decided on a tracking method, you are ready to dive into the details of the challenge. Communication is crucial, and I would say the most important. If you are not organized and communicative, employees will get frustrated and likely not participate in future activities. You’ve got to get this right so be thorough in the planning process. I like to have all communication and deadlines calendared out in advance. Your communication calendar should include emails, social media, print/posters, and verbal notices. Start the hype and make sure everyone knows the launch date and details well ahead of the challenge commencing. Provide a Pre/Post Program survey to evaluate interest and satisfaction. 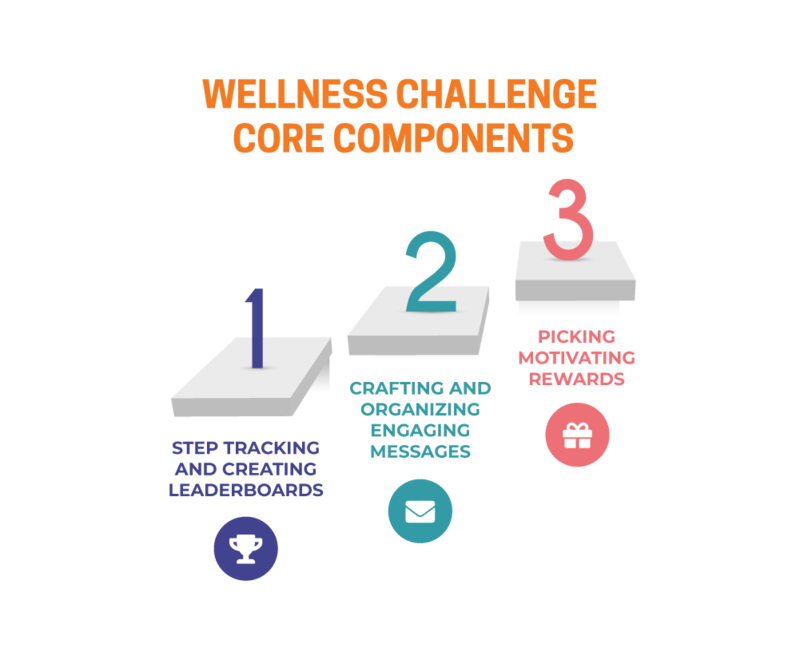 Throughout the challenge, distribute educational materials and motivational messages to increase engagement and retention. Some topic ideas… benefits of walking, health risks of sitting, etc. Your leaderboard must be accessible, distributed or displayed consistently throughout the program. We’ve got to stir that competitive drive. And the finale (drummmrolllllll)… REWARD YOUR WINNER! (or winners if your challenge involves teams or departments.) Public recognition is always powerful. Send an email shout out or post photos to a physical leaderboard in the building. Prizes depend on your wellness budget. You can offer extra vacation days, a purchased prize, or freebies from your community.